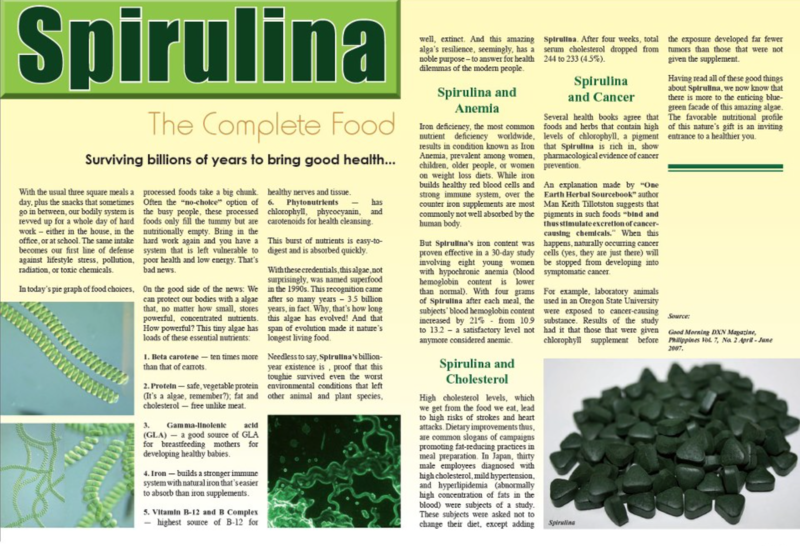 Forum - Products » Spirulina - Why take Spirulina? Vitalpilz Forum » Forum - English Language » Products » Spirulina - Why take Spirulina? We all are very convinced that the ganoderma mushroom is helping us to maintain fairly good health. But are we convinced that spirulina is as important to our body functions? Here is something I learned from a talk given by an experienced ganotherapist to an audience in Hungary. His explanation is simple and easy to understand by most of us who are no experts. First he gave an illustration of a car. People usually prefer to own a new car over a recycled or used car. What about our blood in the body? Do we prefer new blood or recycled blood? The answer is obvious. He went on to ask: What is the basic element and main source to produce new blood? Chlorophyll! Many people think it is iron, but it is chlorophyll. Spirulina is pure chlorophyll. Today people eat very little green food. Let’s think for a moment why green food is so important for the body. When you go to a restaurant they don’t provide green food. It is very bulky and you cannot store it for long time. Do we eat a lot of green food for breakfast? How about lunch time? Dinner? But when we are in lack of green food the body has to recycle our old blood. Recycling blood is a very complicated process. Blood cells only live for about 90 to 120 days and then die. The dead blood cells accumulate in the spleen. There they start to decompose and are send to the liver. The liver decomposes the blood cells further and with the help of the kidneys they are reconstructed or recycled. If we do not eat green foods we put stress on our spleen, on our liver, and on our kidneys. Nowadays we hear about a lot of kidney failure. One reason is because people do not eat green food. What is the strongest green food in the world? Spirulina! We take spirulina so we can have brand new blood in the body instead of recycled blood. So, we want to have new blood in your bodies and give our organs some rest to recover instead of stress. In time our body will reward us with more energy and less pain. I was very impressed by this simple and convincing explanation. At the moment I take 20 tablets daily, others take 30 or even 60 tablets, depending on each one’s health issues. What is spirulina, and why is it important? Spirulina is really an amazing whole food that can be grown in almost any climate. People can survive on little more than spirulina alone, due to its high concentration of vitamins, minerals and protein. It has gained popularity in recent years, and has been touted as one of nature's most perfect "whole foods". That alone would probably not be enough to arouse my interest. The most exciting part about this food is its recent "discovery" by modern man. Spirulina could help to ease or eliminate food shortages around the world. It is an extremely nutritious whole food that takes up minimal space to grow and store. It's cultivation results in absolutely no soil erosion or damage to the environment. No pesticides or chemicals are necessary to grow it, and cultivation has been successful in a variety of third-world countries. Spirulina is an extremely concentrated miracle food - a special health food - with a nutritional and pigment profile which should blow the mind of any neophyte not previously exposed to special health foods and nutrients. Spirulina is not viewed as a "supplement," but as a whole food in its own right. Spirulina is a newcomer to most of the modern, "civilized" world: Spirulina was only discovered about 55 years ago, by a Belgian, in Africa, who observed natives harvesting this food, from the surface of a lake. Spirulina not only contains a mind-boggling volume of superior nutrients - Spirulina also contains special phytonutrients and pigments which are not contained in any other food. Nowadays our diet is low in green leafy vegetables which are abundant in chlorophyll. Lack of chlorophyll intake may lead to toxic accumulation caused by our daily activities and life style. Living and working in the hustle and bustle of the big city surrounded by the smog of vehicles and the eating unhealthy food are harmful to our internal health and may lead to poor skin complexion and accelerate the aging process of the skin. Spirulina as an alternative source of high quality protein and green vegetables. DXN Spirulina is a type of blue-green algae which is full of life-giving nutrients such as protein, beta carotene, chlorophyll, vitamin B complex, minerals, essential fatty acids and other important nutrients that our body needs. NASA has done a lot of research on spirulina and its ingredients to find that spirulina is the best form of food for astronauts. Spirulina is virtually the only vegetarian source of vitamin B12, which is needed for healthy red blood cells. It contains significant amounts of iron, protein (60 to 70 percent), essential amino acids, the nucleic acids RNA and DNA, and chlorophyll. Spirulina is a potent antioxidant and body detoxifier.